Alternative setting: Aikatsu!, Aikatsu Friends! Before I started Aikatsu Stars (AiStars from now on), I was kind of worried. I’ve heard from multiple places that it ruined Aikatsu, that it turns to crap at a certain point of a show, stuff like that. Since I’ve heard those things about the 2nd season of Aikatsu and I ended up very much liking it*, I said, okay, how about watching it and finding it out yourself? It was indeed a disappointment, but in a positive way. In the end, it became my favorite show of all time second only to Ichigogen, also known as the first 2 seasons of the original Aikatsu (OGKatsu from here on). And after marathoning OGKatsu, especially after Akarigen, it felt refreshing. Those who seek out the same kind of writing as in OGKatsu: you’re going to be disappointed. AiStars is a much more plot-driven show with a darker theme, even though it’s still a character-centric show at heart. If you outright hate drama or drama-centric episodes, this show is probably not for you. Friendly rivalries aren’t gone, but they’re much more serious, especially in the 2nd season; characters can be outright hostile to each other, with deep ideological differences. Idols no longer have to cater to each and every whim of the brand designers in order to acquire new dresses: they’re the brands themselves this time around, designing their own dresses. This goes hand in hand with the show’s main theme, self-producing. Special appeals, which were a big thing in OGKatsu, do exist, but they never get explained; this actually makes the story better, as it has other priorities. Yume is a much more expressive protagonist compared to Ichigo (or even Akari), not hiding her frustration, even capable of tantrums when things don’t go her way – she’s 12 years old after all. That doesn’t make either of them less of a great character (Ichigo is still one of my favorite characters of all time), just make either of these shows different. It has a much more modern feel to it: while OGKatsu felt like I’m watching a show from another decade (not that there’s anything wrong with it), AiStars has a much more dynamic feel to it, feeling very much like an anime from 2016. All in all, it ended up being its own thing without being unapologetic about it. But there are plenty of other things making up for it. The characters are well-written and have complex motivations. You’ll end up caring for them, investing in them. The music is catchy as hell. The show is looking beautiful and as I’ve said earlier, dynamic. The voice acting is stellar, especially Yume’s – she’s voiced by Tomita Miyu, the same VA who voiced Riko in Made In Abyss; remember this name in the future. If these things ended up convincing you, watch Aikatsu Stars. You’re not going to regret it. After the amazing experience I had with the original Aikatsu, Stars had a big challenge to face trying to live up to its quality, did it succeed? Definitely! Aikatsu Stars keeps most of what makes the franchise shine with it's wholesomeness, heartwarming moments, and the constant pain in your mouth due to how much you're smiling watching it, but what this entry has is considerably more drama and serious moments through the story attached to the character development of the cast. If you prefer that this is a big bonus towards trying out Stars, while not really being a negative if you liked the original and you're thinking about watching this one since in my opinion it was well handled through the whole run. Outside of two fantastic crossover episodes with the original (which are perfectly skippable if you haven't watched it) this is a stand-alone story set in an idol school which focuses on “self-producing” (finding your way to stand out and shine, encouraging the search of what makes each of the students unique and great). There are four classes, each specializing on different things, like singing and performing, with the best student of each becoming part of the S4 (best school uniforms in anime btw), the top members of the school that everyone admires and wants to become a part of. The protagonist of the story, Yume, is one of the tons of fans they have and she joins the school wishing to reach the top, will she succeed? - The dances are great from episode 1. The CGI of the original at the start of its run was… mediocre to say the least, but at this point of the franchise things are way different. If you can't stomach the performances at the start of the first series, Aikatsu Stars (or the also awesome Aikatsu Friends) is there for you. 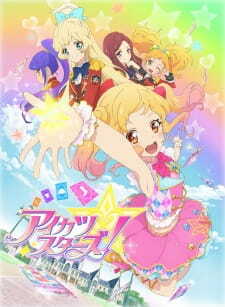 - The story is more compact and less repetitive: While the original has a ton of positives on what happens during the episodes, it's clear that they were just trying stuff at times and ditching them later on to do other things instead, or some parts were like doing 2-3 episodes in a row of the same thing but with different characters, Aikatsu Stars handles this way better and presents a well paced story while keeping the quality and the character development that the original shines with. The strongest part of the Aikatsu franchise is its fantastic characters, and Stars is definitely not an exception to the rule. Before touching on the main characters, I will talk a bit more about the S4 girls, who are some of the best role model characters I have seen. They are at the top of the school and it's well deservedly so, being extremely good at what they do and always there to help the others to improve. They also get focus and development through the series, and the interactions between them and the main characters are some of the best moments of Stars. My own favorite character of this anime is the cheerful Yuzu, there are so many favorite-worthy characters even outside of the main ones! - Yume Nijino is our protagonist of the story. She's a cheerful girl with strong determination and her talent for singing is incredible. You will see yourself cheering for her success and the smiles she wants to give to everyone. - Rola/Laura Sakuraba she's Yume's rival (and therefore best friend by Aikatsu standards) and one of the strongest characters when it comes to their drama and development. She doesn't like losing at all, and in a world full of competition like hers this proves to be a problem. - Ako Saotome, usually looking calm and confident, but actually quite hot-blooded, our (cat)girl loves acting and has a talent for it. She also has a massive crush on Subaru (a member of the M4, basically the S4 of the boys and source of lots of awesome interactions with the main cast) which leads to a lot of fun moments. - Mahiru Kasumi, the most mature girl of the main cast. She shines at modeling, and while her strong aura makes her look difficult to approach (her karate skills don't help with that), she's actually pure kindness. - Koharu Nanakura, a quiet girl and Yume's childhood friend. She joined the school together with her due to her admiration towards the S4, and they are always helping each other. As mentioned above, unlike the original, Stars has quality performances right from the start, that together with the great songs the series has makes for such a fantastic experience and a filled playlist. When it comes to the visuals, this anime is always on point, with some of the most important episodes delivering crazy good animation to add to the impact of the moment. Keeping strengths from the original, presenting another fantastic cast, and giving us more awesome songs that will go to our playlists, Aikatsu Stars delivers a fantastic story full of both fun and emotional moments that, together with the solid character development, makes for a very memorable experience. Thanks a lot for reading! I hope this review convinced you to at least put Aikatsu Stars in the endless void that is the plan to watch from your list, now that I'm up to date with this franchise I feel so empty, a feeling I wouldn't be surprised if you felt as well after watching it! After finishing Aikatsu Stars! I felt giddy, and not many animes can make me feel that way after watching the last episode, including that ones I consistently watch over. Which means, there was something kind of special about this anime. As with the original Aikatsu!, this series focused on idols, daily idol activities and competitions, which is typical in this franchise. For an anime aimed at kids, this was particularly well done, but I did notice that unlike in the original, this one had a slightly more mature tone that the original lacked, which made it enjoyable for the older audience. I won't say anything more to avoid spoiling but the drama in this was definitely heavier than its predecessor. The art is one of the strongest points in Stars!. Everything is so detail-focused that it's hard to say anything bad about the art at all. And I'm talking character and dress designs, and even backgrounds! The animation was also smooth and the 3D performances have definitely improved in quality since the original. Like the art, sound is one of the strongest points in this anime. No matter how many opening and ending songs there were, you remember each of them vividly as they were continually sung by the characters throughout the series at different times. Also, every single episode had a performance, so that was something to look forward to, especially if it was a new song. There was a multitude of songs in this, and that was typical for an anime about idols. Overall, the sound is just amazing. Not much to say about the characters. They weren't poorly written but they weren't particularly special either. The characters' personalities are reminiscent of the original's, which is where everyone sports this positive attitude towards their activities most of the time. But unlike in the original, we actually get to see some antagonists pop up in the first and second half of Stars!. Elza Forte was especially memorable for her prominent role in the second half and I was surprised to see how that second half actually developed with her arrival in Japan. Other than that, the characters did their job of representing the themes of this anime well. Despite my liking for action, horror, mystery and romance, this kind of genre puts me at ease and makes me excited at the same time. It's always refreshing to watch this anime, despite the repetitiveness. In other words, I enjoyed this, A LOT. Bringing everything together, Aikatsu Stars! is one spectacular anime to watch with kids and adults alike. I'd recommend this anime and this franchise in general, to people who are looking for something refreshing after a binge-watch session of Hellsing or other heavy anime, to get that balance back in place, especially if they don't mind this genre. Or just for anyone who's looking for a long anime to escape a bit of reality. I have watched aikatsu since the first original one and the first season of aikatsu itself is really good in my opinion. Though, it become more 'weird' and having no clear direction of the story, after it ended, I have quite high hopes for aikatsu stars. Still, Aikatsu stars has some similarities with the original aikatsu which some makes me happy and some not. For the characters for instance, I don't know why but I kinda think that they are kind of running out of ideas in making new characters? because in my opinion, almost every main character are like fusion of two characters from the original one. Like Yozora, its really obvious that she's a fusion of Ran (appearance) and Sora (name partly and personality). Then Yuzu, fusion of Kii (appearance and most of the personality) and Aoi (some personalities). Hime is like some part Maria (surname and personality), Ichigo and Mizuki (both are like the adored senpai's). Ako is like Otome (appearance and surname) and Yurika (personality). Sakura has some Aoi vibe (both good at many things before) and added with Seira (rivalry). And as usual, Yume, the main idol is soemone who was not very good in idolhood like ichigo and akari. It's kinda disturbing in my opinion though. But, I love how they made few changes in the card system and the arts are actually pretty good. What I love the most is the story is more.... intense, darker and romantic than the original one. I love how there's actually some mysteries about idols itself and its not just any plain boring mystery in my opinion. I also love the fact that it has some romance to it. It makes the story more interesting to watch, I think.